Cable Clamps | Cable Mounting Clamps | Cal Fasteners, Inc.
Cal Fasteners offers cable clamps in a wide range of sizes to make mounting and routing cables, harnesses, and hoses fast and easy. Accurate selection of the ideal size is made simple with clearly identified diameter sizes. Bottom oval screw holes enable quick alignment, and radiused edges protect against insulation abrasion and scuffing. Manufactured from durable, high quality nylon; available in natural or black. ROHS compliant. 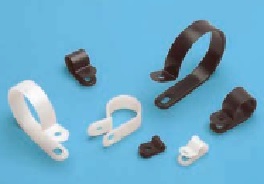 Request a quote on the cable clamps you need, or contact Cal Fasteners to learn more.